I’ve been on a J.R.R. Tolkien kick recently. I often read the Lord of the Rings over the holidays; it’s sort of a wintery thing to do. And once I’ve spent that amount of time in Middle-Earth I don’t want to leave. I usually end up reading more and more. I’ll read the Silmarillion and the Hobbit, but for Christmas I hit pay dirt: my wife gave me five Tolkien books. So I began with relish. Recently, I was reading Tales from the Perilous Realm, a collection of stories that were published in various places in the 30’s and 40’s, and I came upon an interesting passage. It is well-known that Tolkien was friends with C.S. Lewis. They were a part of a group of friends and intellectuals who called themselves the Inklings. 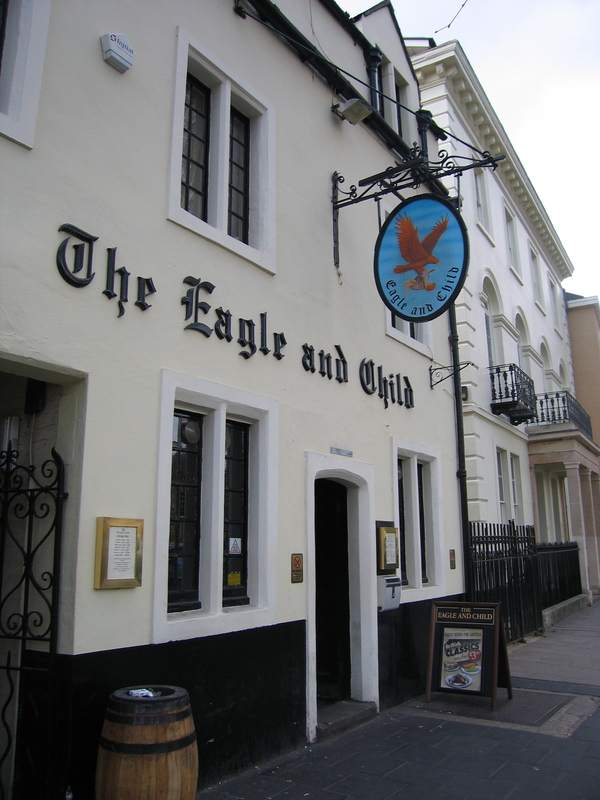 For many years they met weekly at a pub in Oxford called the Eagle and Child, or by those who frequent it regularly, the Bird and Baby. It’s a pretty cool little place (the food is fantastic and the beer quite good! ), and these friends would meet to talk, but also to bring their writing projects and talk about them. They would workshop and criticize each other’s work. It truly was a case of iron sharpening iron. Anyway, I was reading a story called “Leaf by Niggle,” found in the book I’m finishing up. It’s a very interesting story which was apparently a dream that Tolkien had, and when he woke up, he wrote it all down, then went back and edited it up. He writes, “It really added a considerable attraction to walking in the country, because, as you walked, new distances opened out; so that you now had double, treble, and quadruple distances, doubly, trebly, and quadruply enchanting. You could go on and on, and have a whole country in a garden, or in a picture (if you preferred to call it that)” (304). The thing I find fascinating is that I think that here I have found a place where Tolkien’s ideas overlapped with Lewis’s. Tolkien wrote this story sometime between 1939 and 1942, and it is just the sort of thing that he would bring to the pub for comments and/or criticism, or just to let his friends read it. I think that these images of a garden that is bigger inside than outside, and a country inside a painting were things the two talked about, perhaps extensively, because they seem to have worked in to the writings of Tolkien here in “Leaf by Niggle” and into Lewis’s Chronicles of Narnia, written between 1949 and 1954. In the Voyage of the Dawn Treader, Lucy, Edmund, and Eustace are drawn into Narnia through a picture of a ship. They are sucked into the painting which grows and becomes larger and larger until they are in another world. In the Last Battle, the entourage walks west and arrives at the garden on the green hill, surrounded by a hedge. When they go inside, they find that it is bigger inside than outside, and a conversation ensues to that effect. They talk about the fact that many things are like that: that the further in one goes, the bigger and more real things are. They call to one another, “Farther up and further in!” and seek the center of the garden only to find Aslan himself. I like to imagine Tolkien and Lewis sitting together, sipping their beer, reading papers, and arguing about a point of description or discussing these things in a spirited manner. I think that that pub with those men is one of the top 5 places I would want to visit if I ever was given a time machine. Ah, how I love ideas! 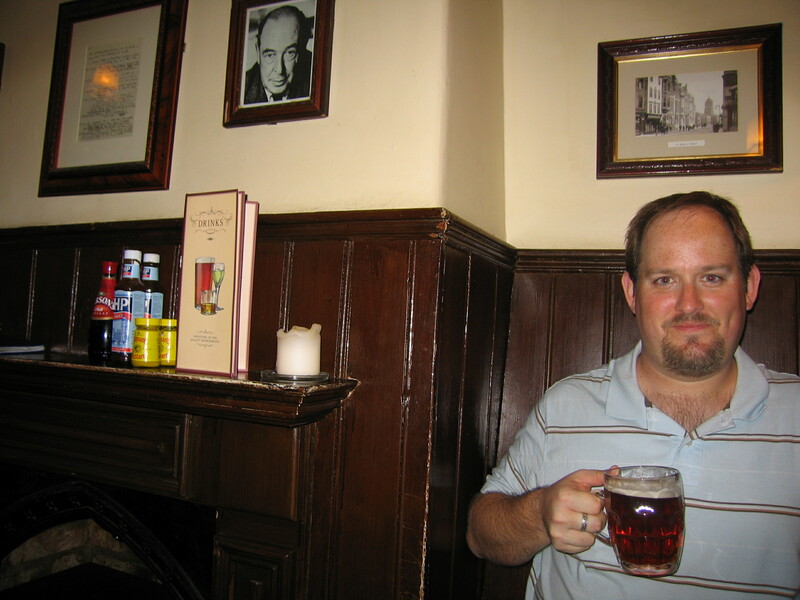 At the Eagle and Child, tossing back a pint. Every now and then I read an article in the news that is so disturbing to me that I find I can’t speak. Let me preface this post by saying that I am extremely interested in technology. I am completing a graduate degree in media studies. I just finished an article on video gaming. But I also am an unapologetic bibliophile. I love books. I love that they are filled with ideas of all kinds. I love the way they smell and the feel of a heavy book in my hand. I like having them around me–on the shelves in my house and in my study. It seems that a certain prep school called Cushing Academy in Ashburnham, Massachusetts, has decided that books are simply outdated and therefore, they have given away their 20,000 volume collection and are replacing it with a cafe, computer lab, and flat screen TVs. There are sublime moments of my life that stand out in my memory: sitting all alone on the beach in Florida watching the sun rise over the sea; standing on top of Angel’s Landing in Zion National Park watching an electrical storm rumble up the canyon toward me; sitting on an old bench outside in a small cloister in Westminster Abbey, breathing in the heart of Britain while sharing a half hour of silence with a small bird perched a foot and a half away; holding a hummingbird and straightening its wings out, brushing it off, and petting its head while it simply looked up at me for five full minutes before it flew away; standing in the Greek Theatre at the University of Redlands, silently talking to God and feeling His presence pressing on the place, filling the huge bowl of earth to the brim; driving a small zodiak boat in the Bahamas with my best friend beside me at dusk in water so shallow I could get out and walk; listening to and smelling the fresh clean rain falling outside through an open window as I sat inside next to a cheerful fire; worshipping God on an open air rooftop in the metropolis of Bangkok as the sun set and shone its last light down on me and the two dozen other Christians whom I could not understand, but who were nonetheless one with me in spirit and purpose. The beach in Florida at sunrise, very similar to the one I sat on--Satellite Beach, just south of here. All of these things are real events; they happened to me, and I lived them. But there are also many memories I have of intense beauty that never really happened to me, at least not in the same way as the above memories. I have intense memories of things that only existed in my mind, brought there by symbols slopped on pressed wood pulp. Experiences that I share with no one else, because no one else imagined them the same way that I did. These experiences I lived through the pages of books and the countless hours spent devouring ideas and stories, descriptions of evil and good, ugliness and beauty, the commonplace and the royal. And anyone who has a passion for stories and books knows exactly what I mean. I just finished reading the Silmarillion, The Hobbit, and The Lord of the Rings, and although they are codices of pages of symbols, they have affected me deeply. I experienced more beauty in them than I have perhaps in my lifetime outside of the world of books. Books and stories can take us far away, and I wonder what it is in our imaginations that is apparently so well-suited to telling stories. We tell stories our whole lives, every day. The function of stories is fascinating to me, but right now I’m just interested in seeing and feeling the sublime again. And that is why picking one’s next book is such an important thing. And if you haven’t had a beautiful moment recently, you need to pick up a well-written book and find a quiet spot, preferably with rain outside and fire inside, and a warm drink, and explore the realms of beauty that can only exist in the mind. The joy of the experience and the after-ache of longing is the reward, and can never be diminished by the sudden jerk back into the shadow land of reality.